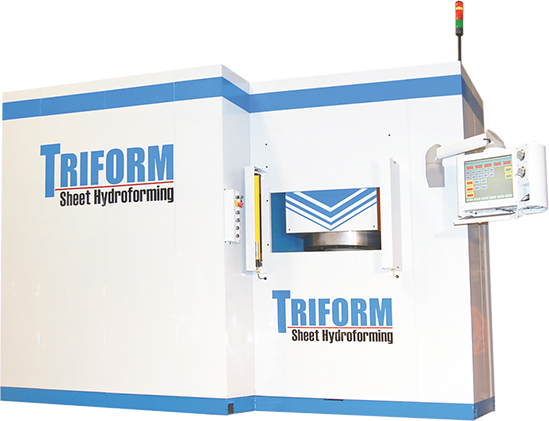 Beckwood Press Company, St. Louis, MO, has expanded its Triform product line with the addition of a 15,000-psi deep-draw sheet hydroforming press, featuring a 12-in.-dia. maximum blank size and a 7-in. draw-depth capacity. The new Triform Model 12-15-7BD is ideal for operations involved with the frequent forming and drawing of high-strength materials for parts fitting within the maximum blank-size dimensions. Examples are medical device manufacturers, who commonly cold-form titanium, stainless steel, inconel, hastelloy and other high-strength alloys. The press includes the same technologies as other machines in the Triform line. Precision diaphragm-pressure and punch-position control combined with built-in recipe-handling capability offer high forming proficiency. Additionally, the In-Sight feature allows the press to be paused and opened at any point in the forming cycle to allow for a visual inspection of the forming process. The press structure itself maintains its compact, flush-floor design, requiring no pits or special foundations for installation. Like the other Triform presses, this model benefits users in the way it creates pressure.